The last four years we've been spending November through June in Mexico, returning to the states for the summer and fall months. In Mexico, in May, as we sweated in the boat, we'd yearn for those cool, moist days in the Pacific Northwest and we'd remember fondly hiking in the greenery and inhaling the sweet smells of the forest. We have a rotation now to keep the mold from growing inside the boat. Day one we pull all the bedding out of the master cabin, flip the mattress up on its side, wipe down the wood surfaces, and bring in the electric heater. Day two we do the same in the vee berth and storage areas forward. Day three we do the quarter berth. Day four we go through the main cabin. Day five we start over again. Fabric must not touch the hull. Paper cannot touch the hull. Clothing is best kept in sealed plastic bags. Air flow cannot be restricted and the dehumidifier must run constantly. We replace the calcium chloride moisture absorbers as needed (Starbrite, DampRid, Dry-Z). When we cook we open a hatch to let the steam out and when the sun (rarely) comes out, we open everything up. Add to these chores, the normal to-do list on a boat and you'll see that we don't have an abundance of spare time. Granted, I do sleep about 10 hours a night and surf the web another 5 hours, but really, we'd be hard pressed if we had actual full time jobs we had to attend to. The Annabel Lee is for sale. Of course, the holidays are a nice diversion and a good excuse to get ourselves invited to a party or two. 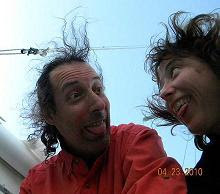 We met Jared and Ashley on Annabel Lee, a Slocum 43, a sister ship to our Passport 42. They are a few slips down from us here at Swantown Marina and their boat is for sale. 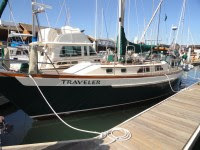 So if you are looking for a boat like Traveler (but nicer) check it out! They recently brought her over from Hawaii and like us, are keeping the fans and dehumidifiers running. It's nice being able to visit with Connie's daughter and son and to go out occasionally and see friends performing at local music venues. We put together a little web page for Connie to showcase some of her music samples and she's looking for gigs locally. In the meantime, we are ticking off the to-do list. Connie is almost finished with the cockpit enclosures. All that remains of that job is to install the bottom snaps. Already we notice how much warmer it is in the cockpit and aft cabin area. I'm getting ready to pull out our old 1981 Wilcox Crittenden Imperial 51 toilet to take up to Tucker at Marine Sanitation & Supply so he can rebuild the intake pump. Many parts are no longer available for this old bronze beauty but Tucker says he can cobble together what's needed to get her back in shape. Sure, we could buy a new model ($500 - $600) but why not re-use if we can and none of the new heads are as tough as the old Imperial 51. Meanwhile, when the rain pours down, we keep the Tupperware under the dripping hatches and continue with our moisture removal regimen. The fronts come roaring in from the west, one after the other. When we do see some clearing, the temperature plummets and we crank up the heaters. I'm sure my electric bill will be outstanding. The other morning we woke up and found the AC power had failed. The shore power cord had shorted out where it plugs into the boat. Since it was a Sunday and the marine stores were closed, I used a couple of 30 amp adapters and a sturdy extension cord to keep us powered. The next day when I replaced the temporary rig with a Marinco heavy duty 30 amp marine cord, I found the little extension cord hot and "melty" from the amp draw of our two 1500 watt heaters. I'm glad we ran them on the 800 watt setting that night. Watch out! This is the kind of thing that starts electrical fires, a leading cause of boat loss. You might ask, "Are you re-thinking your decision to winter over in Cascadia?" The answer is, "Well....Yes". This is where the heater will go. Tech alert! We're getting ready to talk shop now. Clear skies brought plummeting temperatures and the full moon brought extreme tides to the Swantown Marina. At a negative 3.39 foot tide, the ramp was slippery with snow and steep. From above, the boats in the marina looked like they were sitting down in a muddy hole full of ice. We had two feet under the keel and the electric heater couldn't keep the boat warmer than 58 degrees. Time for some action! I got online.. tried to limit my time cursing at the national news... and started researching the parts I'd need to install a Dickinson solid fuel marine heater. With our budget, we could get a propane heater, a diesel heater, or a solid fuel (wood) stove from Dickinson Marine. Checking prices on forced air or hydronic heating systems freaked me out so I ditched that idea right away. A stand-alone propane heater has a low BTU output and I've heard that propane makes the boat damp so that didn't appeal to us. The diesel heater puts out a lot of heat but it costs a lot more than the solid fuel unit, especially when you factor in the fuel pick up, diesel lines, and installation of a fuel pump and day tank. The budget alternative is the solid fuel stove, and still, it's not cheap. I read installation documents, watched YouTube videos, and researched before coming up with a parts list. Then I created a spreadsheet listing prices from five vendors: Fisheries Supply, Go2Marine, Defender, West Marine, and Sure Marine Service. It became apparent that the two contenders were going to be Fisheries and SMS, both in Seattle. My account at Fisheries gives me a discount and I can get free shipping on big orders. SMS has good prices, always. You'll need a very small hex to tighten the arbor. When you add to this, the cost of a Milwaukee 5 inch hole Dozer Saw and a 3/8 inch Ergo Saw Arbor ($57.00 total from Home Cheapo) to cut a big hole in the deck I'm still getting the heater installed for less than $1000.00.... one boat dollar. That's the NEW boat dollar. I used to call 100 bucks a boat dollar but that's in the past. We are in the brave new future now my sweet hearts. Connie woke me up this morning (25 degrees outside) at 8:30 with a cup of tea and I spent a nice 20 minutes sitting up in bed, stepping through the process in my mind to get that stove installed. After a bowl of cereal and a hike up to the public facilities (29 degrees outside) I was ready to go. First I measured how far off the wall the stove pipe would be and centering it on the wall just in front of the mast, I made a dot on the ceiling with a magic marker. Then I measured forward from the mast so I could go up top and see where the stack would pop out. On deck (31 degrees outside) I measured forward from the mast and noticed that the location would place the front of the hole just inside of some teak deck screws. So I went back down below and moved the location aft a titch. I recommend measuring multiple times and going on deck often so you don't screw up and cut a hole in the wrong place. As it is, I still messed it up.... but just a bit. Getting out the power drill, I found a sharp bit and drilled a hole in the ceiling. On deck (33 degrees outside) I located the hole and inserted the hole saw. Then I had a flash... a thought... and then went down below and sure enough I forgot to include the half inch stand off for the backing plate. I drilled a second hole a half inch to the right of the first. Back on deck I inserted the hole saw and started cutting into the teak deck. The saw bucked and caught and carried on like an angry jackass so I put it in reverse and started the hole, drilling counter clockwise. That worked better and soon I had penetrated the teak deck. I pulled out the five inch round teak plug to use later as a big coaster for my growler. Now the fiberglass was visible. I'd drill for a minute, then vacuum up the mess, then drill again until finally I got through the fiberglass. By this time the temperature was up to 37 degrees... balmy. I took off my gloves. Prying out the fiberglass plug. Prying out the plug I admired the solidness of the deck. There is a thick layer of fiberglass, then some marine plywood, then more fiberglass. These old Passports, they made them stout. Down below, I'd left the quarter inch ceiling board in so that it would catch any sawdust and glass debris. Now I began to grind through that layer with the hole saw and soon I had my finished hole. What's this? Two bare wires? Heck, I'd sawed through the DC connection to a ceiling fan. What a dufus! Note to self: next time, peek under the ceiling board and check for wires. Note the thick glass top layer, the plywood center, the bottom glass layer. See the cut wires in upper right hand corner. Hot air from the cabin came pouring out of the hole and it became warmer on deck. I removed my hat.It must be 40 degrees now. A heat wave. After covering the hole with a Styrofoam box I went below and mixed up some resin and hardener to coat the core. When drilling through a layered deck you should seal the sides of the cut so that IF (let's just say "when") it leaks, the water won't get into the core and rot the wood. Don't let one scrap of dust get into the marine environment! All that's left is the Naugahyde head liner fabric. While waiting on the resin to kick I removed the ceiling panel and repaired the severed ceiling fan connection. Next I inserted the deck fitting and gasket, screwing it to the deck with stainless screws. I slid the exhaust cap onto the deck fitting and it sure looked pretty. Down below, I put the ceiling panel back up and screwed the collar fitting over the hole. Now I'm good from above deck to below deck. I used three stainless steel panels to protect the wall from heat, screwing them directly to the teak wall. I'd called the guy at Dickinson to ask if I needed to put some kind of fiber board or insulation behind the stainless steel shields but he said that was not necessary. Bonus! Once I had the shields on, Connie helped me assemble the stove pipe, the damper, and the stove all together. Connie held the unit in place while I marked where to drill the stove mounts. Then I removed the one lower heat shield panel and drilled four mounting holes, breaking three drill bits in the process. Drilling stainless steel with cheap drill bits is fun. We peeled the protective plastic off the parts, bolted the stove to the heat shield, then screwed it to the wall. Ta Da! Done. Taller than the Trump tower. Connie got out the vacuum. I got out the wine. Thanks for staying with us for this technical diversion. Tomorrow we go to a protest march at the state capitol. You know why. Coming home to the boat last night after listening to music at Oly Underground, we found ice on the deck. "Be careful honey, it's slippery." Snug below, we checked the two heaters and went to bed. This morning we found that Traveler was ice bound. Yes, "pack ice" had formed here in Budd Bay, locking all the boats into the marina. Instead of calling for a USCG icebreaker, we stayed in bed until ten when the flood current was at its highest and the sun shone brightly. With a mighty creak and a moan, the ice began to fragment and melt along the sunny side of the boat. I'd never seen salt water freeze. 28.4 F is the threshold freezing temperature for sea water and, as we all know, fresh water freezes at 32 F. I was dancing a jig heading down the dock, dodging the frosted-over sections, and marveling at the frozen surface water. I think it may be true that at this point of the tide, and here many miles from the ocean, the salinity of the water is quite less than that of the open ocean. Fresh water coming in from nearby creeks might be floating on top of the salt water and freezing somewhere above 28.4 F. Whatever the reason, it is a pretty site. Our Festivus pole is our mast. Just a few miles west of here in Mud Bay, folks are taking precautions because of an anticipated glacier moving slowly down McLane Creek. That's how cold it is here. Inside the boat, condensation is forming on the windows and the inside of the hull. We've put out three Dry-Z air dehumidifiers and take care when cooking to vent the galley area. You see, we are trying to fight the onslaught of mold and mildew. It's tough here but, come to think of it, not as tough as it was on the high seas so I'll stop my complaining. Actually, don't expect me to stop complaining. I can see by my page hit counts that the blog entries where I whine and complain a lot get the most traffic. So don't blame me if I stretch the severity of the situation a little bit. I'm giving you want you want and it's not fake news, just enhanced. Now, Scott... Don't get started on the "fake news" problem we have today. This is not a political blog. That's what Facebook is for. Our plan is to winter over here in Olympia. Connie can play music here with friends and I can frequent the local used bookstores, walking around town with my hands in my pockets, along with the rest of the whistling unemployed. We planned on getting jobs here to boost our cruising kitty but we've put that on hold for a couple of months because...... wait for it....... we're going cruising in Mexico for two weeks in January! After spending a few nights shivering around the portable heater, I got online and found an old cruising acquaintance in Guaymas who agreed to let us sail with him from there to La Paz. We've been saving our Alaska Airlines flyer miles for a while now so I cashed them in for tickets to Tuscon, with a return from San Jose del Cabo. We'll fly into Tucson and get on the Tufesa bus that will take us across the border and south to Guaymas, about 300 miles. Oops, sorry, that's 480 kilometers - Mexico doesn't have miles. We've got 140 pesos left in our cash stash, that's about 7 bucks USD so we'll have to buy more at the border. The exchange rate is crazy low right now - a dollar gets you 20 pesos so we'll be living high on the hog for our three week stay in Mexico, three weeks because we're tacking on a week of travel to go to Cabo Pulmo for snorkeling and diving at the reef there. What a wimp I am. A few weeks in 40 degree temperatures and I go running back to Mexico! I guess I'll call a few folks and see what kind of deal we can arrange to get the boat show price before or after the boat show. Pleezzzzzzeeeee! Give us a deal. On these cold days we look back fondly at our recent time in California. It sure is pretty there. Oh I'm a solitary man... yes I am, walking the golden hills of Californica. It's 35 degrees headed down to 28 tonight so we'll be sleeping in our long johns again. I'll be listening for that pack ice forming. Get the boat hook ready! Shackleton had the same problems.